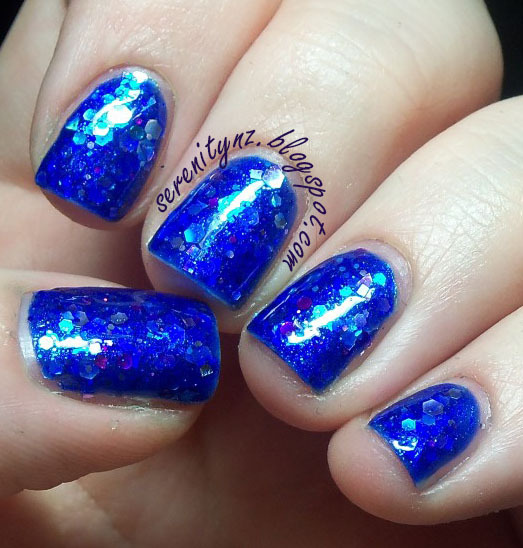 I've had swatches of this on my computer for a while, I don't know why its taken me so long to do a post because this polish is gorgeous! Battle Royale has a royal blue crelly base with lilac, lavender, silver, purple, turquoise, teal, periwinkle, magenta hex, dots, shreds and squares in holographic and metallic finishes. The pics show three coats with one layer of Poshe top coat. 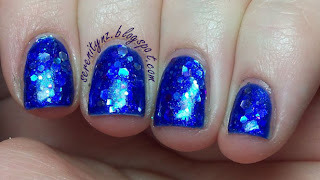 The formula was good - application was easy, especially for a polish this packed with glitter. I didn't have to put any effort in to get a good amount of glitter on my nails. 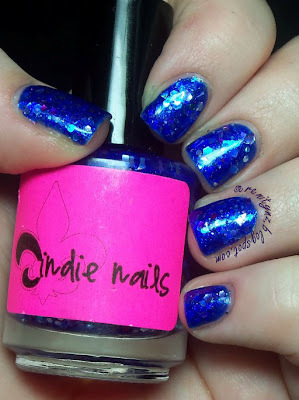 Jindie polishes are available from Harlow & Co., Llarowe, Mei Meis Signatures and within the US at the Jindie Nails website.